Once again, a top recommendation from Scott Pack, Director of Digital Product Development at HarperCollins, but better known as @meandmbigmouth - book reviewer extraordinaire. Much obliged sir. If you like books called 'Snow' then the compelling and slightly claustrophobic title written by Orhan Pamuk is well worth a go. If you like Japanese novels , I'd recommend one of my favourite authors, Haruki Marukami. If you want something that's a little bit of both, then this is the title for you. Snow tells the story of the son of a monk, Yuko Akita. He writes poems exclusively about snow. Each haiku is beautiful, and yet, they lack colour. When a famous court poet, Meiji, hears about the legendary snow poet, he visits, advising Yuko to go in search of the master of colour. Snow chronicles Akita's journey in haiku-sized chapters. Haunting and mesmerising, it weaves a picture of the quest for purity, art and colour. 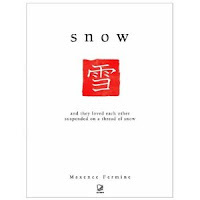 Written by Maxence Fermine, originally published in 1999 and translated by Chris Mulhern, Snow is a slight, wonderful float across haikus, Japan and snowy capped mountains.